Thanks to Vaneeza for making this guide! This is the full solution, including spoilers. If you want to play the game, there are hints online at the Poptropica site. 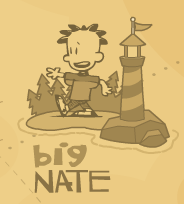 All right, here is a complete walkthrough of Big Nate island in Poptropica. 1. First get the top of the Comic page from the guy at Klassic Komix. Collect the 8 missing pieces from around the island : there’s two in the school, one atop the school by the cement scaffold, one at the top of the lighthouse, one above the playground, one in the Pop-In shop, one in the photo place, and one on the electric poles (right side of the wire). 2. Once you have successfully found all of the comic pieces (there are 8), assemble them and go back to Klassic Komix and give them to the guy . He will give you some gum. 3. The combo on the comic is 9 3 0 5. Go to the school and up to the second floor where you should find a stuffed messy locker. Open it up with the combo. Find the blueprints inside. 4. Go inside the science lab where there are three chemicals on the counter. Mix the yellow and blue and heat it, and you make a stink bomb. Go back downstairs by the detention room and chew your gum. A teacher will take you inside the detention room where you can set off the stink bomb. Once the teacher leaves the room, open the 2nd drawer of the filing cabinet, and go down the ladder. You will have to find the light (power) switch which is down and to your left – the blue hand will appear. There will be a swinging thing (the clapper of the school bell on the top of the school). Before you can repair the bell, you have to get rid of a seagull that keeps knocking you away. 5. Go to the lighthouse which is as far as you can go to the right of the island. You can climb up the little metal tongs on the side. There is a floating piece of paper to the left of the lighthouse which you have to jump off and hit as you go down. You will automatically pick it up. It is an old photo. 6. Bring the picture back to the photo shop and give it to the man there, who will give you scuba gear as a trade. 7. Go back to the lighthouse, put on the scuba stuff, and go dive in the water. (You can aim your mouse down and click ‘dive’. Go to the bottom of the water towards the right of the screen quickly and try not to get forced up by the air bubbles.) There is a long rope attached to a rock and a lobster trap next to it. 8. Go up. To do this just click ‘up’ where you dove in. Give the lobster trap to the old sailor (Cap’n Salty) who in return will give you a lobster and jet ski keys. 10. After that you can go back to the lighthouse, use the telescope to spot “Seal Island” out in the bay. Ride the jet ski with the keys the captain gave you. You have to beat Nate to the island. On the island push both seals to the far left of the seesaw rock. Go under the rock and get the map. Return to the main island. 11. In the “Kids Only” house on top of the playground, challenge Nate to a game of Hangman. Once you win, he’ll give you some crackers. Place a cracker on the ground where the schoolgirls were. The lost dog will dig holes until you find the capsule. Click on the box and pull it out, and click on the gold button. Once it’s done loading, Big Nate will be a hero and you’ll get your medallion. *Note that the lobster (after using it to change the direction of the light) will return to your inventory, as will any item you use (except the stink bomb). ** Even once you have the peanut butter crackers, you still have to go to the lighthouse telescope, and get the map from Seal Island. Otherwise Spitsy the lost dog will only dig empty holes.